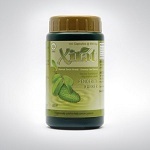 Xirat extract is made from the leaves of the Sirsak Plant, a proven traditional herb helping people with cancer, and tumors. The Sirsak leaves from the plant contains Acetogenin, which innhibit the grown of cancer cells. • Traditionally used for cancer patients • Antioxidant and anti-tumor. Acetogenin in Xirat could inhibit cancer cells by inhibiting the metabolism of cancer cells. Normal cells are not affected by the work acetogenin. Composition: Annonae muricata folium extract.